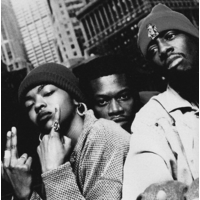 The Fugees (pronounced /ˈfuːdʒiːz/) were an American hip hop group who rose to fame in the mid-1990s. Their repertoire included elements of Hip hop, soul and Caribbean music, particularly reggae. The members of the group are rapper/singer/producer Wyclef Jean, rapper/singer/producer Lauryn Hill, and rapper Pras Michel. Deriving their name from the term refugee, Jean and Pras are Haitian, while Hill is American. The group recorded two albums—one of which, The Score (1996), was a multi-platinum and Grammy-winning success—before disbanding in 1997. Hill and Jean each went on to successful solo recording careers; Michel focused on soundtrack recordings and acting, though he found commercial success with his song "Ghetto Supastar". In 2007, MTV ranked them the 9th greatest Hip-hop group of all time.